Lauren from Guthrie and Ghani spread the word about this much loved free pattern. All around the internet, Sorbetto lovers were apparently whipping them up in an afternoon. This was not my experience. The pattern photo and the instructions definitely look beautiful and were easy to follow. The advice about joining the bias at the centre back was particularly good. For me, though, the pattern was a struggle. It fitted around the neckline but almost nowhere else. The armhole was way too long and too wide which I only discovered once I’d finished attaching the bias binding trim. The darts were very conspicuous and strangely angled. I ended up changing the pleat, the darts, the armhole, the width of the binding and four inches off the length. 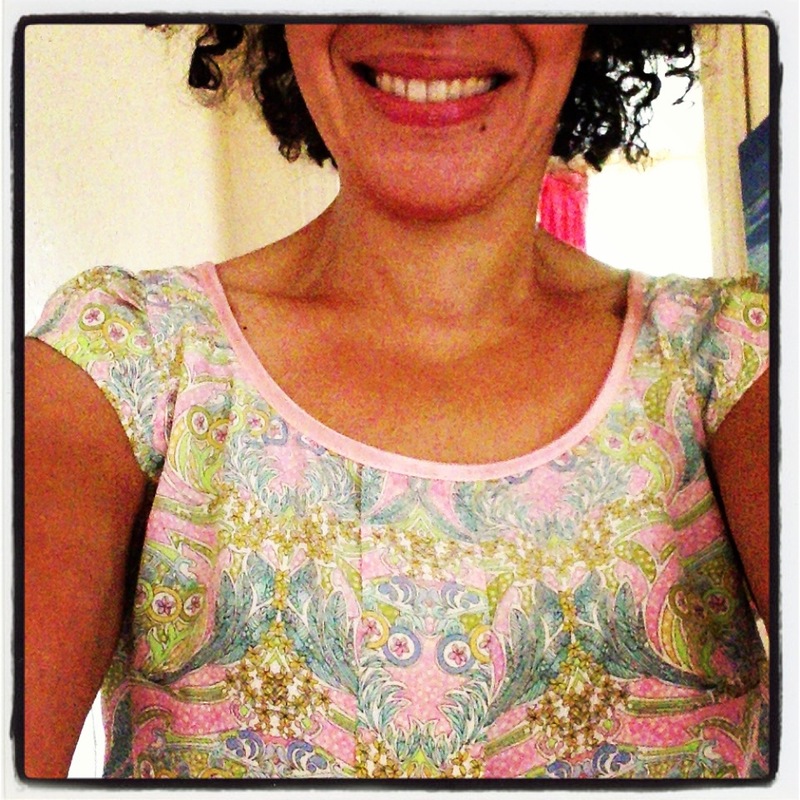 The fabric was 60cm of Liberty print silk de chine, bought in one of the fabric shops in Berwick Street, Soho. It is satisfying to make something with very little fabric! I added sleeves from my favourite pattern, New Look 6022. I learned a few things along the way and I know this (free!) pattern’s very popular, so it was worth doing for the experience. Next time I could make a muslin first! 23 Jul	This entry was published on July 23, 2013 at 10:36 am. It’s filed under sewing and tagged sewing, sorbetto. Bookmark the permalink. Follow any comments here with the RSS feed for this post. Older: Hot weather favourite from 1984? Newer: Poster girl for the quilters?